When I first heard about the recent Swiss referendum to ban minarets in the country, all I could think about was how unexpected it was to get such a hostile action from the Swiss. Weren’t they supposed to be the all loving, peaceful, neutral European country? Apparently not. The Swiss clearly are just as freaked out about the surging Muslim population in their country as many of their European neighbors. It should be noted that far-right parties in Italy, Netherlands, and Belgium all welcomed the Swiss referendum, and called for similar measures to be taken at home. All this makes me think about an article I read a few years ago in Foreign Affairs called, “Europe’s Angry Muslims.” It was horribly offensive and it outlined major European nations’ problems with integrating their Muslim communities: The Algerians in France, Turks in Germany, Moroccans in Spain, and Pakistanis in London. To give the article some credit, it was a brutally honest analysis of Europe’s growing “Muslim problem.” It was also the first time the threat Muslims pose to European secular culture was articulated to me. Initially I thought the Swiss were having a delayed reaction to their Muslim population, but after reading H.A.’s Hellyer’s “Daily Beast” piece on how Europe’s Muslims should respond to the Swiss, I see that Switzerland’s move has to do with a much larger issue of European identity. This point makes me think of renown literary theorist Edward Said’s book (read: masterpiece) Orientalism. In it, Said states that the West has always defined itself against the Orient, against the “Other.” He stipulates that one basis for European colonialism was the feminization of the Orient, of the East as a wild, untamed woman that must be controlled and contained. So what happens when the “Other” moves into your country and becomes a citizen? Demands the same rights as you? If you begin to view the situation from this perspective, you begin to understand the roots of European paranoia. It also becomes startlingly clear to you how insecure contemporary European identity must be, so easily threatened. This however does not vindicate what is happening in Switzerland. The fact of the matter is that hostility towards Muslims in Europe is rising. I have written previously about the need for American Muslims to do more to provide tangible responses that clearly separate us from the violent acts committed in the name of Islam. But it’s a different ballgame for European Muslims. You hear so many calls about the need for Muslims to “better integrate” themselves into European society. But how can they really when European laws such as this Swiss law and the ban of the burqa in France make it so difficult for Muslims to even pretend to be equal citizens with their fellow Europeans? Blatantly prejudiced legislation against Muslims is not only still being authored and introduced, it is even praised by other European nations. 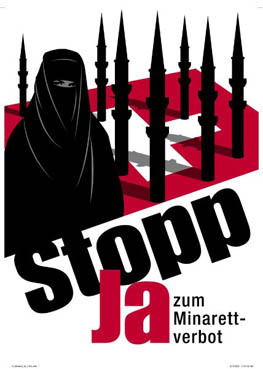 While what is happening in Switzerland today gives an opportunity for Swiss Muslims to stand up, speak out against this blatant discrimination (just look at the Swiss People’s Party’s poster! ), and demonstrate their peaceful contributions to their societies, I have to agree with Hellyer. I fear this is another very troubling sign of growing Islamophobia in Europe- and increasing isolation of its Muslim populations. Well, as I don’t really agree with the Swiss answer to the question of minarets (and mind you it is only questions of minarets) I think you should read up on European history. Europe as such has been exposed to Islam or Muslims most probably for a longer time than the Indian subcontinent. Also where did you get this ‘blatantly prejudiced Legislation’ in Europe from? As you most probably know, in Europe as well as USA, legislation is concerned with individual rights and obligations, not collective rights as e.g. communist countries. Historically, Europe and US have worked for generations to separate state from religious institutions and that has mostly been successful, in such a way that most people take for granted non-interference of religion in their daily life. That is not to mean that people are not aware of their history and connection to their (mostly christian) symbols. I also believe that European politicians and other elites f–d up the ‘integration’ issue, which at times results in xenophobic knee-jerk reactions from the ‘people’. And then I totally don’t get this thing with Said and ‘feminization’ of the Orient. Who feminized who? great article anushay – i agree with you on a number of points. its a tough call, to be fair. i do agree that the Swiss populace’s refusal to allow Muslims to use the traditional architectural style borders on authoritarianism. but then, as i discovered, it is among many authoritarian aspects of life in Switzerland. Apparently, in Switzerland, the city council specifies what trees and in what ratio you are allowed to plant in your yard, and what architectural template your house must conform to and even how many inches the window on your barn can be, etc. etc. The rationale is that Switzerland is largely dependent on tourism – and the country and its landscape and culture should be consistent with the postcards that lured the tourists in. Its slightly psychotic, but thats the way it is. The point is, immigrant Muslims are not the solitary targets of Swiss society’s rigidity on what is the “Swiss way” and what is not. Even those who are from robust “Swiss” stock face resistance to diversity. It is equally true that we all need to find a way to express our diversity of cultures and practices, without violating each other’s sentiments and values. only one thing: this article in IHT, just proves my point that the American view on Europe and Islam is even weirder than what the xenophobes in Europe manage to produce. As I said before, read your history for pete’s sake! The people of Switzerland recently expressed their view in a referendum that the construction of minarets should be banned in their country. Not only is this law utterly illogical in its intent, but it is also symptomatic of a wider Islamophobia that has gripped the Western world ever since the attacks of September 11th. Although, in the medieval era, Islam was the catalyst for trade, cultural and scientific development all the way from southern Spain to western India, the religion has become grossly mischaracterized as a violent, radical sect intent on bringing total destruction to the West through brutal acts of terrorism. Islam has also become noted in various media outlets for its supposed oppression of women. As you say in one of your posts, images of women oppressed under the Taliban regime were used to draw popular support for the invasion of Afghanistan following the attacks on the Twin Towers. While it is surely important to keep in mind that the Taliban were an extremist sect of Islam that enforced a hyper-conservative version of the Shariah law in a brutally authoritarian manner, it also would be wrong to neglect the low social status that women hold in many Islamic societies. Some may argue that it is difficult to uncover what the fundamental religious texts of Islam say about the rights and status of women. As it is with almost any religion, there exist a wide variety of interpretations about the role of women in a Muslim society. Most seem to agree that women should have equal rights when it comes to property and the basic necessities of everyday life. Some religious scholars argue that men and women are equal in all aspects except one—that men are more superior because they are meant to be the overseers and guardians of women. They say that women cannot be independent, that women cannot be leaders in society. Other interpretations completely disagree. They insist that women must have equal rights when it comes to education, marriage and property. Whatever a wife earns through her own salary is rightfully hers to use. This implies that women should be able to seek their own jobs outside the household. It is undeniable that giving women equal rights and opportunities in all areas is a necessary precursor to the fair and balanced development of any society. As far as I am aware, this has been amply demonstrated in Bangladesh in the past few decades. I am concerned as to whether Islam will prove to be an obstacle for women in Islamic countries today, particularly in getting equal access to education and employment. I wonder if certain societies are purposely confounding the teachings of Islam with subjective interpretations of Islam. I cannot help feeling that the message of equality, located at the core of Islam, has been subverted over the centuries in favor of a patriarchal society. At its core, removed of subjective bias, is Islam in support of women’s rights? How are women in Islamic societies overcoming the barriers set in place by society? Excellent points. I couldn’t agree more.